Discover where your imagination can take you with a wireless HP ENVY 5055 all-in-one designed to help you be creative and stay productive. Print borderless, high-quality photos and crisp text at home or on the go from all your devices—the HP Smart app lets you easily set up your photo printer, scan documents on the go with your smartphone camera, and print from social media or the cloud, such as iCloud, Google Drive, and Dropbox. Highlights: Wireless, all-in-one color inkjet printer. HP Smart App: The HP Smart app allows you to easily set up your wireless printer, scan documents with your camera, and print from social media or the cloud, such as iCloud, Google Drive, and Dropbox. Highlights: Wireless, all-in-one color inkjet printer. AN ALL-IN-ONE THAT SAVES TIME AND MONEY – Breeze through scan and copy tasks from the 2.2" mono touchscreen, and use up to 50% less paper with automatic two-sided printing. Wireless Connectivity: FAST CONNECTIVITY, SO YOU DON’T LOSE A SECOND – Easily set up this HP ENVY all-in-one printer on your local network wirelessly, either from your smartphone with Bluetooth Smart or your PC. Print Speed & Duty Cycle: PERFECT FOR HOME AND HOME OFFICE – Get up to 10 pages per minute black, and up to 7 ppm color. Recommended monthly volume of 100–400 pages. Product Dimensions: Minimum dimensions: 17.52 in. W x 14.45 in. D x 5.04 in. H Maximum dimensions: 17.53 in. W x 22.22 in. D x 5.04 in. 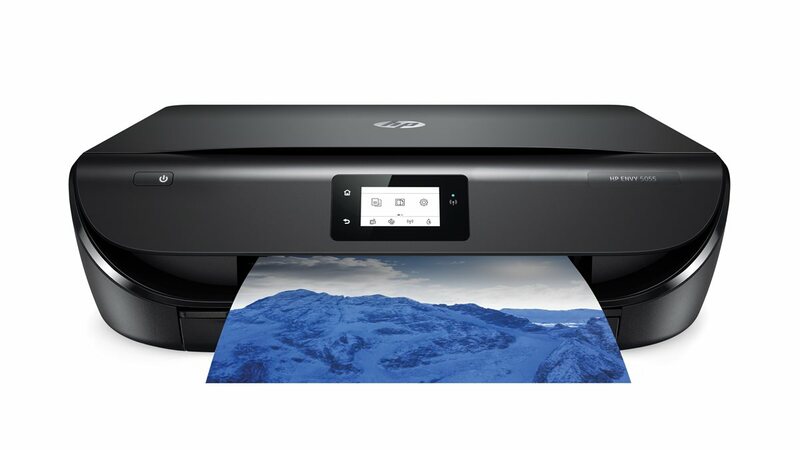 H.
Media Compatibility: This HP ENVY all-in-one printer works with letter, legal, 4 x 6 in., 5 x 7 in., 8 x 10 in., and No. 10 envelopes. Display and controls: CONTROL YOUR PRINTER WITH A TAP AND SWIPE – 2.2-inch (5.58 cm) capacitive touchscreen hi-res monochrome LCD graphic. What’s in the Box: M2U85A HP ENVY 5055 All-in-One Printer; HP 65 Setup Black Cartridge (approx.. 120 pages); HP 65 Setup Tri-color Cartridge (approx. 100 pages); Ink Caution Flyer; Power Cord; Setup Guide. Original HP Ink: This photo printer uses Original HP 65/65XL ink cartridges. Get up to 2x the pages with Original HP XL Ink Cartridges compared to Standard Cartridges. maximum sheet size 8 1/2" x 14"